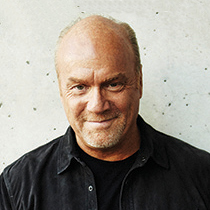 In the second segment of his three-part interview by the Billy Graham Evangelistic Association, Greg Laurie talks about having doubts, stepping out in faith, and being empowered by the Holy Spirit. How are you convinced of the security and surety of God’s promises? Have you ever experienced doubt? It’s a good question. Why do we doubt God? In Peter’s case, it seems it was because he took his eyes off of Jesus. It’s easy to be critical of the old fisherman,but the fact is that none of the other apostles dared walk on water to meet Jesus. Peter not only tried, but he succeeded for a few steps, and then, perhaps seeing the impossibility of the situation or looking back to see if others were watching, he took his eyes off of Jesus and began to sink. We need to always look to the Lord, and remember His great power to save. If we have a "big God," we will have small problems. But if we have "big problems," perhaps our God is too small. By that I mean that we are failing to see God in all of His power and glory. The best way to combat doubt is to fill your life with Faith. Faith is the opposite of doubt. And how do you you build your faith? The Bible says, “Faith comes by hearing, and hearing by the word of God” (Romans 10:17 NKJV). In what ways should we have wild abandon and vulnerability in our faith… and not be worried so much about security? I would say that in attempting to serve the Lord, we will make our mistakes in our attempts, for instance, to share our faith. But I would rather try and fail then never try at all. It’s been said that the doorway of success is often entered through the hallway of failure. Read the Bible. It is chock full of stories of people who took risks. Sometimes they failed, more often they succeeded. Think of Gideon, Moses, Elijah, Daniel, or the Apostles. They all faced incredible, even seemingly impossible, odds, yet they trusted God and changed our world. Don’t be afraid to take a step of faith and approach that friend, family member, co-worker, or even complete stranger with the gospel message. You may be amazed by what the Lord will do. What does it mean to be indwelt by the Holy Spirit? What kind of security does the Holy Spirit provide? When you believe in Jesus Christ, the Holy Spirit comes in you, or indwells you. Also, as part of that great work of conversion, the Holy Spirit seals us. Ephesians 1:13–14 says, “In Him you also trusted, after you heard the word of truth, the gospel of your salvation; in whom also, having believed, you were sealed with the Holy Spirit of promise, who is the guarantee of our inheritance until the redemption of the purchased possession, to the praise of His glory” (NKJV). It’s like putting down cash to hold something—a deposit. God wants you to know that He is sincere about redeeming you. He intends to complete His transaction. He won’t back down or change His mind. So He gives us the deposit, or “down payment,” of the Holy Spirit in our lives to show us that He means business. The Holy Spirit is also our helper and teacher. Not only does the Spirit bring about the work of conversion, but as a result, He seals us, teaches us, and leads us to truth. John 14:26 says, “But the Helper, the Holy Spirit, whom the Father will send in My name, He will teach you all things, and bring to your remembrance all things that I said to you” (NKJV). The Holy Spirit can, in an incredible way, open up passages of Scripture for us. It comes through our reading and study of God’s Word. Scripture tells us in 1 Corinthians 2:9–11, “‘Eye has not seen, nor ear heard, nor have entered into the heart of man the things which God has prepared for those who love Him’ But God has revealed them to us through His Spirit. For the Spirit searches all things, yes, the deep things of God. For what man knows the things of a man except the spirit of the man which is in him? Even so no one knows the things of God except the Spirit of God” (NKJV). The Holy Spirit also empowers us for service,so we will have greater boldness to share our faith (see Acts 1:8). Can Doubt Be a Gift?